The Only All Inclusive Company With Consulting & Safety Services, Security Training & Non Vocational EDU Courses. The Freedom Safety Agency will develop and maintain partnerships through diplomacy, education and integrity, in order to protect our homeland from all hazards. ​Florida Business Association: 2004-2013 & 2016! East Lansing Adjusters Association: 2001-2009, 2011-2014 & 2016! ​"I would recommend the Freedom Safety Agency to anyone who is looking for a professional and personable company that would bring a level of planning and consulting for your safety needs." 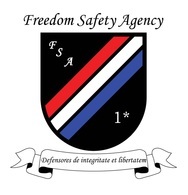 ​ALL MATERIAL OF THE FREEDOM SAFETY AGENCY "FSA" IS COPYRIGHTED © 2019. ALL RIGHTS RESERVED-FSA LOGO IS A REGISTERED SERVICE MARK OF THE FREEDOM SAFETY AGENCY LLC. USE OF ANY FREEDOM SAFETY AGENCY LLC MATERIAL & LOGO IS NOT PERMITTED BY LAW.